Heavenly blog! : No. 722: Why not have the ability Pastor Jan Aage Torp to apologize or forgiveness? No. 722: Why not have the ability Pastor Jan Aage Torp to apologize or forgiveness? Why not have the ability Pastor Jan Aage Torp to apologize or forgiveness? 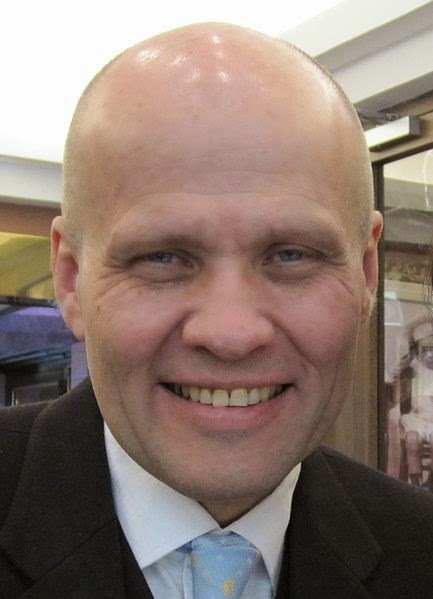 Photo of Pastor Jan-Aage Torp, which in my estimation is under the influence of demonic powers that makes him unable to ask for forgiveness. What I want to apologize for two things Jan-Aage. 1) This was the situation and images that are harmless, and to use these in a setting so we do just to show and illustrate who we refer are okay. When text constitutes the bulk of the content. And the pictures are not offensive. 2) Require money from anyone without first having given any opportunity to repent and do something about it is both inappropriate and vulgar and unchristian! If you ask excuse for this, so I can well remove the article first business day after the holiday is 4th of August. Jan Åge Torp answers: Hi Jan Kåre Christensen! I was just made ​​aware of Walter on this blog post that you leave out for a couple of hours ago. I have nothing against you publish this, if it benefits your interests. I took Walter of "matter" that happened without my knowledge and approval. I think that Walter has communicated neat about rights on our material and I am glad that you have removed the photographs that we have the copyright on. But apart from this I am not happy that Walter was involved so strongly. We have no opinion on Smyrna Oslo and Jan Kåre Christensen. My helping hand to you in the spring of 2012 proved to be fruitless, and I do not intend to resume communication. Forgiveness, Torp possibility that he will not stand! There are many who struggle with forgiveness. Many feel condemned because they can not forgive. "Forgive us our debts, as we forgive our debtors", it then becomes difficult to pray. I think some of the difficult may be because we misunderstand what forgiveness is. We feel that it means that we accept the evil that is done to us. But forgiveness presupposes the contrary, we recognize that evil is evil. There are offenses that can be forgiven. Many, especially those who are victims of abuse, struggling sense of guilt itself. They need help to place the blame where it belongs - with the abuser. They need someone says that what was done to them was evil, and that it was not their fault. To get range with forgiveness before this truth is fallen in, is completely wrong. "To forgive is to judge," said the Croatian theologian Miroslav Volf. He was subjected to psychological torture by communist secret police, and he has seen the atrocities during the civil war in the former Yugoslavia. How can a woman who is raped and saw her husband and sons be killed, ever forgive? How can I forgive him who interrogated me? This is the specific basis for his books. For him it is an important acknowledgment that the evil deeds just put in place as evil, through forgiveness. This was the genius of the reconciliation process in South Africa. In countries such as Chile and Spain they have just put a line over what was and moved on. When the wounds are still there and works. In South Africa had been a truth commission, as did the evil deeds to light and placed the blame for what had happened. Only then could they be forgiven. Forgiveness - the lack of healing, and more! If one is not able to forgive, then feel free to disease other ailments provided. We know that scripture also says if one does not take the sacrament properly, so one can not expect healing. Joh. AD 10 10 The thief comes only to steal and kill and destroy; I have come that they may have life and have it more abundantly. The thief is here a symbol of Satan, he has a mission and a mission, it is to steal and kill and destroy. While Jesus has the opposite mission it is to bring and give life and abundance of life, Hallelujah! Illness origin is Satan, not man. But through Jesus' death and resurrection, we can have victory over sickness too. Although neither I nor any other people fully understand everything here as it is only when we as believers have a glorious body and Jesus is like us to fully partake of Jesus' victory on the cross of Calvary. Can believers be sick to depart from God's way? Scripture is very clear here, it is indeed! As believers, we have a big responsibility, but we obviously can not say that all disease is necessarily your fault that we have gone away from God's path. But I will list ten different points why God's people - believers - are sick and die prematurely as God has promised us here 70 years and 80 years of much strength. There is also another issues are those that are born with a special function, reducing or've got it. These are of course not to blame for this, but they can and should be cured either here or in the time when Jesus will come again and we will be like Him and receive glorious body like him forever. It is only when we all are healed, until the time we are all subject to b corruption, the perishable and our human limitations and "block". I have been accused and added things here because I illuminate these issues, but it must unfortunately always expect to be given opinions and views. Do you have these, write on the blog or contact. False and untrue rumors and allegations are just annoyance, frustration and strife and dissension. Psalm 90 10 Our life time, it is seventy years and, when there is abundance of strength, eighty years, and its glory is labor and vanity; for we were speedily driven forward, and we flew off. 1) Lack of knowledge of what God's word and promises of God is and remains the largest scarce for the believers at all times. To the army of Biblical and anointed teaching of any subject in the word of God is and remains the largest scarce for believers of all times. Hosea 4 6a My people are destroyed for lack of knowledge. 2) Unhealthy lifestyles. We know that God has created us with an inner and outer man so that we are a two-piece creation. That's why it's so important to take care of the body with physical work, training or other means. God does not want the body shall lapse, either too little or too much work, training or other means. Here all and any responsibility for their own physical condition it is always through the years has shown that there are also many challenges it offers of being human. 3) Eat right and "right". We know that especially in the Old Testament, God has given His food scientist snags and we read that what is written is spiritual and healthy. Therefore, there is much to learn and recall of living as God's word says and learn if we do not have an order in the new covenant to follow all the precepts of the Old Covenant. But eating healthy and sturdy have with our healing! 4) If we do not discerning the Lord's body and a regular meal so we are in danger of not only remain sick, but actually also fall ill teach writing. Think about it, we can get sick by "abusing" our faith. 1 Cor. 11 27 Wherefore whosoever shall eat this bread, and drink this cup of the Lord unworthily, shall be guilty of the Lord's body and blood. 28 But let a man examine himself, and so let him eat of that bread, and drink of that cup! 29 For he that eateth and drinketh unworthily, eateth and drinketh judgment to himself if he does not discerning the Lord's body. 30 Therefore, many frail and sickly, and many falls asleep. 5) We as believers should confess your sins to one another, then we promise to be healed. In fact, the Catholic confessional is more biblical than we know it, where can one go into confession and confess their sins font encouraged us and to be healed. James 5 16 Confess your faults one to another, and pray one for another, that ye may be healed A righteous man's prayer has great power in its effects. 6) Not having a church community and other believers as a stand together with a negative impact on us as believers and people when we are put to bear one another's burdens. And on the way to be healthy and not sick. If you read quickly through the first five verses of Galatians chapter six, it may look as if it appear ¬ because it apparently is a contradiction between the second and fifth verses. In verse 2 says, "Carry each other's burdens, and so fulfill the law of Christ." And in verse 5: "For every man shall bear his own load." How can this be? Yes, according to the basic text, you will find two different words for "burden" in these two verses. In Galatians 6:2 use the Greek word baros, meaning "heavy burden." In verse 5 is the Greek term fortion used, which means "a task or service is performed." Here it is a responsibility burden, a burden until it is executed. This byrdebæringen is not legalistic coercion. The design, however, grace and love and obedience perfect law of liberty (James 1.25). The Lord has thus added one should in each of us, but for us is nevertheless exhortation clearly: "Carry each other's burdens," We can not bear the burden instead of the suffering, but we can carry them with them . We can not cry tears of others or feel their loss, but we can be present where tears and there are missed big. We can be present so that the sadness, hopelessness and difficulties are a little easier to bear. 7) We must not only bear one another's burdens, but we should also pray for and with each other when we are members one of another. And then the way is in a relationship of responsibility to each other as believers. The demonic influence will never be able to get a foothold with us if we stand together with Spirit-filled believer brothers and sisters. It is when we will not listen to advice, admonition and align us by the word of God and each other that the demons get a foothold. A good and healthy church community is the greatest care, it is a hostel that Jesus spoke of in the parable in Luke 10 for he who fell among the robbers. Rooms. 12 5 So we, being many are one body in Christ, and every man for himself, we are members one of another. 8) God has appointed in the church someone who in a special way to pray for the sick and others in need. If the service suppressed and neglected so will the rate of sickness among the believers be greater. and this service will be heeded, then we can expect that there are believers who are healthy and fast and live their day to full measure. But it is strange if it is someone who has received a special gift to pray for people and taking care paid to pray for them. When abusing those whom God has given it, manage it wrong or has taken on a task and service that they have not got! 1 Cor. 12 28 And God hath set some in the church, first apostles, secondarily prophets, thirdly teachers, after that miracles, then gifts of healings, helps, governments, diversities of tongues. 9) Grace gift to heal and pray for the sick is also given to several believers, not just the special gift to pray for the sick. It is the church's concern and there is more than one to pray for the sick of the word of God speaks that one too as they have a very special and God-given spiritual equipment and anointing to pray for the sick, demon-possessed and reveal things. In order for people to be set free for the Son therefore shall make are really Fri.
1 Cor. 12 10 To another the working of miracles; another prophecy, to another discerning of spirits, to another various kinds of tongues, to another the interpretation of tongues. 11 But all these worketh that one and the same Spirit, as he distributes to every one according as he will. 10) Every believer has a responsibility to be in right standing before God, take care of their bodies and their health. Rummage itself is very healthy if one is sick and fall short. It may be demonic influence, unhealthy lifestyles, disobedience, lack of fellowship with other believers, lack of awareness and knowledge of the promises we have etc. than is sick and not at full health. We're on a very large and important topic. But God's word and God's promises are fixed, we all have full healing and restoration of Jesus' death and resurrection. Scripture says that by "By His (Jesus Christ) stripes we are healed." Final Comment: If you have questions or wish to be prayed for, contact dear friend. We pray for the sick and teach what God's word says about healing. Should also taken more with how demonic influence, disbelief and another puts us out of the game, I have to come back to at a later date here on the blog or on our website or submitting relevant questions or writing on your blog. 1 Cor. 11 30 Therefore, many frail and sickly, and many falls asleep. This is taken from where the Apostle Paul taught about the sacrament, there were those who abused communion meal to eat themselves satisfied. And they saw no difference what the sacrament and was a regular meal. This in turn resulted in the blessing that is in Jesus' atonement on Calvary was not part them, but actually made that judgment was brought into their lives. It was a combination of lack of understanding, disobedience and carnality that brought them to trial. It is such today that there is a lack of understanding, disobedience and carnality that keeps many Christians from being in good health and healthy in spirit, soul and body! God has not changed, nor humans we have a better understanding in some areas we have a poorer understanding in other areas. God wants us believers to be healthy and live at least until we are 70-80 years old, yes too long! Psalm 90:10 Our life time, it is seventy years and, when there is abundance of strength, eighty years, and its glory is labor and vanity; for we were speedily driven forward, and we flew off. Jos 2:10 p.m. And now you see that the Lord hath made ​​with me as he said, and let me live for forty-five years since the Lord spoke these words to Moses - since Israel wandered in the wilderness; and today I am eighty-five years old. Jos 24:29 And some time after this death, Joshua son of Nun, the servant of one hundred and ten years old. 3Joh 1:2 Beloved I wish you all the parts must feel good and be in health, even as thy soul feel good. The promises are many, but God's word speaks of a good, long and happy life as a believer where we are overcomers in all areas of our lives. I do not know everything, but God's word speaks from that we can expect at least 70 years here on earth, and of much strength even further. Joshua and Caleb was 85 years and at its full strength and power! As I see it, has been a believer of youth so have a clear tinned to have walked with the Lord. Joshua and Caleb had God's spirit as the others had the spirit world. They were also then at full strength at the age of 85 years, and we as believers can also expect to see a good, eventful and exciting life. Where we are in good health and healing simply follow the Lord. God's people are sick because they have insufficient understanding, disobedient and carnal, that keeps many Christians from being in good health and healthy in spirit, soul and body! Just as many in the church at Corinth were sick, frail and died prematurely, God's people today. Illness is from Satan, and all this overcame Jesus on the cross! 1 Peter 2:24 He who bore our sins in His body on the tree, that we might die to sins and live for righteousness: by whose stripes ye were healed. When Isaiah renders this word he says that by his stripes we are healing, as Peter says we are healed. At Calvary's sacrificial death are all believers healed purely objectively. It is for us to take out of our wealth and healing we have in Christ Jesus NOW! Evangelist AA Allen prayed for the sick in the thousands, and they were healed. But although he died a premature death, why? I believe that he is not fit enough on their own lives and their bodies. Therefore it is so important that we are not only concerned with everyone else, but also with ourselves and our relationship with the Lord. The most important thing is that I feel good about God. Other people must make their own choices! Is it possible to die prematurely? Unfortunately yes! Of course I have not the answers to everything, and it may well be that God allows things for nothing worse will happen. Or he has other things going on when souls are and will remain the most important. But as believers, we can and should we expect God help us all things, even to be in health, just as our soul well, all glory to God and to the Lamb! When God the Father even look at healing as our bread and we pray the Our Father give us our daily bread so there is healing in this petition. Expect and believe God, that we all may live long. Joshua and Caleb were at full strength at the age of 85 years, was not it wonderful? Expect and believe that God is the same today as he was, for he is indeed. Illness is from Satan and good health is from God, that's for sure when Jesus said that thief is a term for Satan that his mission was to steal, kill and destroy. While the Lord's mission is to give life, yes life in abundance Hallelujah! This is not something we should merit, it's all in the atonement. It's just for us to walk worthy of the Lord and believe His word and do what we can to the best of ability. Then he blesses us and protects us. Nothing is too hard for God, everything is provided through Jesus' atonement and sacrificial death on the cross of Calvary 2000 years ago, God be praised from now until forever!